The drive from Promhills Cabins to Tidal River is very scenic. Drive slowly and carefully to avoid collisions with wildlife and enjoy the views. Along the way, there are pull-ins off the road where you may be able to spot a kangaroo, wombat or emu. There is easy access to beaches throughout the drive, the most spectacular being Squeaky Beach and Whiskey Beach. Once you reach Tidal River enjoy the bush walks leaving from around the Information Centre and cool off at the beautiful Norman Bay (which is safe for swimming). Mt Fatigue: Features a 360 degree view that takes in Corner Inlet, Wilsons Promontory, the hill country and coastal areas. Take either the road out of Foster or Toora heading towards Mt Best to Mt Fatigue. Toora Wind Farm: Turn left at Toora for the short drive up to the wind turbines, stop at the lookout on the way back down the hill. Stop in at the Toora Pub for a great meal on the way too or from the wind farm. Agnes Falls:Turn left at Toora and head into the hills of the Strzelecki Ranges following Silcocks Hill Road, Hazel Park Road and Agnes Falls Road. At 59 metres, Agnes Falls are the highest single span falls in Victoria. Incorporate a stop at the wind farm or Royal Standard Hotel on the way to or from. Cape Liptrap Lighthouse: A short drive from Walkerville. Turn into South Walkerville Road then right into the Cape Liptrap Road. The lighthouse was built in 1951 in cast concrete, and is octagonal in shape. It was converted to mains power in 1970. Spectacular views of the coastline to Wilsons Prom. Walkerville Lime Kilns: The burnt out lime kilns left over from past activity are incredible to explore. do the short Limeburners Walk or the 1.2 kilometer Overlook Walk. See the historic cemetery, go swimming, fishing or boating, or just spend an afternoon exploring the rock pools and the remains of the lime kilns. Grand Ridge Road: One of Victoria's most spectacular drives. Winding through 132kms of tall mountain ash trees and steep fern gullies, the Grand Ridge Road showcases a whole panorama of Strzelecki wilderness as it follows the route of the pioneer settlers. Most of the road is unsealed and can be accessed via the Korumburra-Warragul Road, at Mirboo North, at Tarra Bulga National Park or at Willung South on the Hyland Hwy. Sandy Point Surf Beach: A short walk over the sand dune, opposite the general store. Waratah Bay Surf Beach: We consider this the best beach for children, access via the boat ramp, opposite play-ground. Whisky Beach in Wilsons Promontory: The first easily accessed beach as you drive to Tidal River is Whisky Beach. Only a few hundred metres walk from the car park. The short walk into Whiskey Beach takes you through a Tea Tree tunnel, then opens up dramatically to a glorious pristine beach. There is a short walk from Whisky Beach over the headland to Picnic Bay. Picnic tables, chairs and toilets are available at both Whiskey Beach and Picnic Bay car parks. Squeaky Beach in Wilsons Promontory: Arguably Wilsons Promontory's most iconic beach. Yes, the sand really does squeak. A short walk from the car park or choose a longer walk via the Tidal Overlook Track. Explore the rock formations and enjoy a refreshing swim. Norman Bay in Wilsons Promontory: Close to Tidal River campground, Norman beach is a short walk via Whale Rock or accessed from the Norman Bay carpark. Great for a swim, it also offers stunning views of Mt Oberon. Bear Gully: consisting of lots of enchanting little coves with a mixture of sand and rock. Ideal for swimming, snorkelling, skin-diving and fishing, and wonderful coastal walks. Hourigans Camp Lane Walk – From Millar Road turn into 'Hourigans Camp Lane' to enter car park. Follow the track along the boardwalk to the beach. Distance: 500metres (10 mins one way) - an easy walk. By walking quietly along the track, you may see and hear the various birds and animals in their natural habitat. The beach offers sandy tidal flats, where at low tide the channel is clearly visible and on high tide a vast sheet of water consumes the Inlet. Duck Point Walk - Commencing on Foley Road, this trail leads through thickets of Coastal Tea-tree to the sheltered waters of Corner Inlet. Scenic views across the Inlet to the peaks of Wilsons Promontory are the feature of this walk. Distance 800 metres/30min return Shellcot Road - enter reserve area marked 'Red Bluff' and follow track to beach. It is very pleasant to walk in either direction, but to the right you will see the 'Red Bluff' jutting out. ('Red Bluff' is formed out of a very reddish clay). Red Bluff Road - Follow a very bushy track down to the boat sheds. This is a mangrove area and can be quite squelchy under foot. To the left, towards 'Red Bluff', the very rare 'Yanakie Berry ' (bright red berries with very prickly leaves) can be seen in fruit in the late Autumn and early Winter. From this location enjoy the wonderful views over the Inlet. Be aware that this is a tidal area, and even at low tide the shoreline can be very boggy. Yanakie Landing Walk - Starting at Foley Road the track winds its way down to the rocky beach area, then back up through the Old Quarry. Distance approximately a 1.3km circuit with some steep sections. The lookout has good views of Corner Inlet and over Mt Singapore, Mt Vereker, Mt Margaret, Mt Hunter, Mt Roundback and Chinamans Knob. At its best at high tide, the Landing features small sandy coves punctuated with rocky outcrops and platforms that are perfect for exploring and for lolling about on in the sun. Agnes Falls - At 59 metres, Agnes Falls are the highest single span falls in Victoria. Hidden within the green, rolling hills of the Strzelecki Ranges, the meandering Agnes River cascades over rocks into a deep picturesque gorge. The Agnes Falls are reached from the South Gippsland Highway at Toora by following Silcocks Hill Road, Hazel Park Road and Agnes Falls Road. Alternatively the Agnes Falls Reserve can be reached from Welshpool via Slade Hill Road and Hazel Park Road. These approach roads provide extensive views across Corner Inlet to the peaks of Wilsons Promontory. A short 200-metre walking track leads from the Agnes River Reserve car park to a viewing area overlooking the falls. A small picnic ground set among the tall shady blue gums on the grassy banks of the Agnes River makes a delightful setting for a picnic. Corner Inlet Marine and Coastal Park - Start at the Yanakie Landing Circuit picnic area and car park on Foley Road . Proceed to the boat launching ramp at Corner Inlet and pick up the sea shore walk to Duck Point and beyond to the Coastal Park. Hoddle Range Mount Nicoll Lookout Walk -Drive to Fish Creek-Foster Road and to Mt Nicoll car park. Proceed on foot on-to the Hoddle Range walking track and beyond. Koala Walk - Franklin River Reserve to the Toora Cemetery walk along Dorans Road , is a natural habitat for koalas. Sandy Point walk/bike path - Commencing at the beach-end of Manuka Street car park, the path goes through coastal bushland to the Shallow Inlet Road , crosses over, then goes all the way to Shallow Inlet through stands of coastal tea-tree, banksias, eucalypts, acacias, and a short section of tidal marsh-land. Port Franklin Wetlands Walk - The Wetlands Walk allows visitors to wander out onto the wetlands to explore. Watch for the mud crabs as they scamper along at low tide. Loader Walk - (2km) Loader Walk begins at Mount Nicoll between Fish Creek and Foster. A moderate classed walk with spectacular views. Rail Trail - Walk, ride or cycle the rail trail (in sections) between Leongatha and Foster. The walk is generally easy but has slight inclines in places. Cape Liptrap Coastal Park and Historic Lime Kilns - Drive to Walkerville South. Proceed on foot along Waratah Bay to Walkerville North sea cove and the historic lime kilns. Visit the nearby heritage listed cemetery. You are now in the Cape Liptrap Coastal Park . Whilst there visit the Cape Liptrap Lighthouse. Bald Hills Wetlands Bird Life Reserve - The Wetland Walk is 750 m in length, about 15 minutes one way. The meandering walking track from the car park takes you through open woodlands and Paperbark thickets to a large shallow wetland. From the bird hide you will be rewarded with the sight of a variety of birdlife. The trail is suitable for wheelchairs and prams. NB: The drive from the main road to the Bald Hills wetlands is approximately 5km. The road surface is gravel and can be reasonably rough in places. Bald Hills is a lovely reserve but can at certain times of the year be popular with snakes. Please exercise caution during snake season. Port Welshpool - Along the beach to the historic long jetty (it is still closed to the public). Pass under or around jetty and continue walk along the beach to the mangrove area where there are usually groups of black swans and other sea birds. Return walk time around this part of Corner Inlet is approx 40–60 minutes. Leaving from Port Welshpool, cruise for a full day (8 hours) along the remote coast of Wilsons Prom, around the Lighthouse and Skull Rock. Fully catered with buffet lunch and snacks included. These cruises run a few times per year, enquire or see website for dates. A tour showcasing the region’s food and wine, the people and the country in a fun, relaxed and informative way. Small group tours meet the producers, see their farms, and feel the passion that goes into their produce – get connected with the origins of your food. See gold mining display and records depicting Foster's gold mining origins, history and pioneers. Open mid-December to March, on days where the forecast for Leongatha is 26degrees or higher. Visitors welcome all year round. Casual dress to be worn with flat soled shoes (or bare feet). Opened in Sept 2014, the cheese experience center is set amongst the pastures and animals on the farm. View the cheese making process or soak up the beauty of the Moyarra Valley from the verandah while enjoying a tasting plate of cheeses made on site. Journey back to the difficult working conditions of mining days past, seen through interpretive displays, audio visuals and heritage walks, Go underground into the mine. The accredited Gippsland Maritime Museum is located at historic Port Albert, 1 hour from Yanakie. Its extensive collection is housed in the heritage listed 1861 bank of Victoria, built to store gold from the Gippsland gold rush. Its archives are available for research. Like to be pampered or relax while on holidays? Massage treatments, facials, manicures, pedicures, thermal body treatments, waxing, hairdressing. Foster North: 6km north-west from Foster along the South Gippsland Highway , the views are spectacular. Hoddle: Fish Creek-Foster Road, approximately 5kms from Foster - picnic table with spectacular views across farming country and Corner Inlet to Wilsons Prom. Sandy Point: Ned Neale's Lookout, Beach Parade, Sandy Point , with picnic tables, viewing platform, and boardwalk to the beach. Waratah Bay: access lookout from the car park at The Gap (the first car park entrance as soon as you round the bend towards Waratah Bay. Venus Bay viewing Tower: Lees Road Venus Bay . Views across the Anderson Inlet flood plain with a plethora of wildlife. 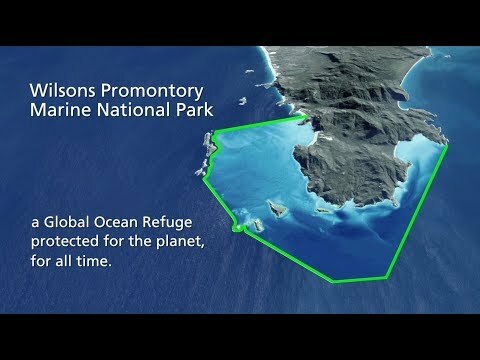 WHAT'S UNDER THE WATER AT WILSONS PROMONTORY MARINE NATIONAL PARK?